Q: What type of practice do you work in? Q: How long have you been with this practice? Q: What are some of the duties you are responsible for within your practice? A: I always chuckle to myself when asked this because there is no short answer to this question! Responsibilities in working to keep the practice operating at the highest level possible, functioning as seamless as possible, delivering the highest level of patient care, and keeping an office culture that makes work enjoyable is a never ending list of responsibilities! Managing a team, overseeing the entire practice from top to bottom, partnering as a fellow office executive with the doctors, and being responsible for thousands of patients each year isn’t a job I take lightly. I do my best every day, and I am thankful for the amazing doctors and team I am blessed to lead! 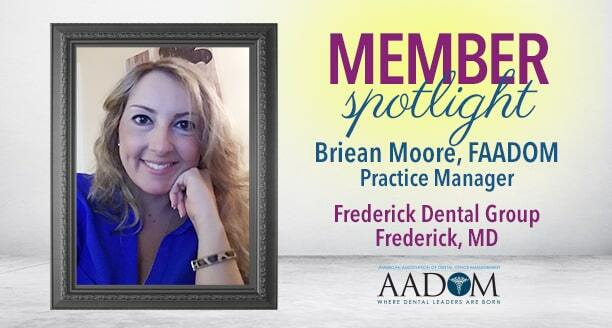 A: What I love most about my career are the challenges that come with always working to raise the bar, and pushing to learn the latest advancements in dentistry. Dentistry changes every day, and pushing myself to know the best and be my best is a rewarding accomplishment that directly impacts the level of care I can bring my patients. I pride myself in being able to relate to any patient, and devote my time to educate them in their treatment options so we can work together to accomplish their goals with life changing dentistry and I love that! Q: What do you see as some of the benefits of membership to AADOM? A: Having a relationship with so many like minded professionals is good for the soul! Since joining AADOM I have met SO MANY amazing people from around the country that face my same struggles, have the same heart for their patients, and that I relate to on so many levels. Not only professional growth is a benefit, but the personal growth from the friendships is certainly the best unexpected benefit! Q: What other services would you like to see AADOM provide for dental office managers? A: AADOM has made it known that they are constantly pushing to have more resources at our fingertips. I have no suggestions at this time. Just keep doing what you’re doing! Q: Have you ever attended an AADOM conference? Q: Can you tell us about your experience? A: The experience at AADOM is something everyone needs to experience. A conference re-energizes and refuels you to go back to your office and keep going and have an army of resources! Q: Are you planning to attend AADOM18? Q: Are you a Fellow or are you pursuing Fellowship? Q: What practice management software do you use? Q: What company do you order the majority of your dental supplies from? Q: Do you or your practice support any charitable organizations? A: Yes. Mission of Mercy, Doctors Without Borders, and the Make a Wish Foundation. Q: What are some of your hobbies/interests outside of work? A: I love finding new adventures, and exploring new things. I love to travel when able to and have recently created quite the bucket list to start on. When I’m not bit by the travel bug, home is where my heart is. Family and being a mom is everything to me! I would also have to say that making people laugh, having fun, and making memories every chance I can keeps me going.